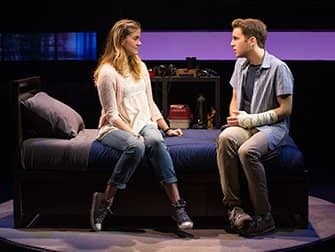 Dear Evan Hansen on Broadway tickets are easily purchasable online. I recommend purchasing your theatre tickets before you go to New York to save time and money. Dear Evan Hansen is playing in the Music Box Theatre. The story focuses on Evan, a high school student who feels invisible. As a sort of therapy, he begins writing letters to himself. One of these letters accidentally falls into the hands of Connor, another school outsider. When Connor commits suicide, his family conclude that, against expectations, he had one good friend, Evan. Evan, therefore, finds himself faced with an important decision: does he let everyone continue to believe that he and Connor were good friends, or should he disappoint Connor’s family and put himself in an awkward position by telling the truth? 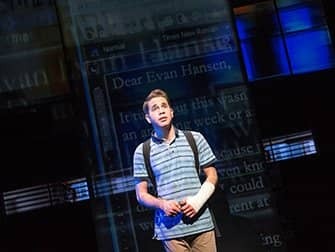 Buy Dear Evan Hansen tickets now, pay no service fee and pick-up tickets directly at the theatre!